"While some affect the sun, and some the shade. Even in 1743 publishers were not convinced that a book length meditation on death, in blank verse, was a commercial proposition. 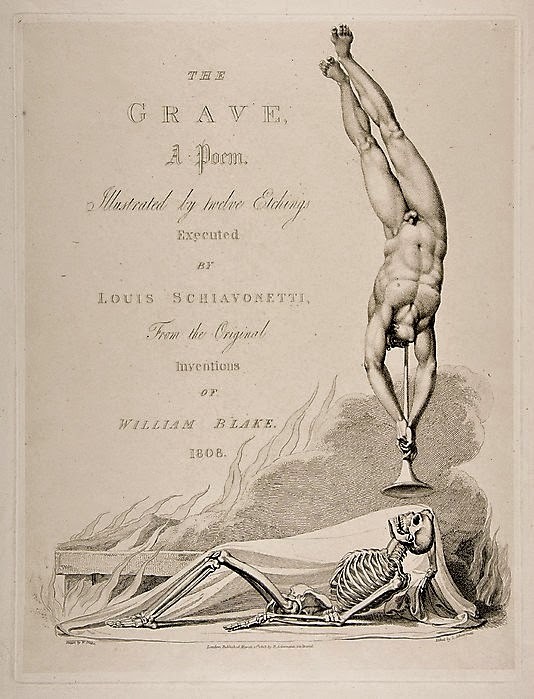 The Scottish clergyman Robert Blair had real trouble finding someone willing to publish his gloomy classic “The Grave,” and if it had not been championed by Isaac Watts it might never have seen the light of day. After being rejected and rewritten “in order to make it more generally liked..[and] to make such a piece go down with a licentious age,” as the author wrote to a friend, it was finally published by Mr Cooper. It was not a instant hit but by 1798 there had been 47 separate editions and, along with Edward Young’s “Night Thoughts”, was considered essential reading for all late eighteenth century men of sensibility. Jonathan Tyers, the owner of Vauxhall Gardens, had copies of both books chained to lecterns at his Temple of Fleeting Life and Inevitable Death at Denbies, his Surrey estate. For his 20 guineas Cromeck became the owner of Blake’s extraordinary original watercolours and when he died in 1812 they were inherited by his widow. 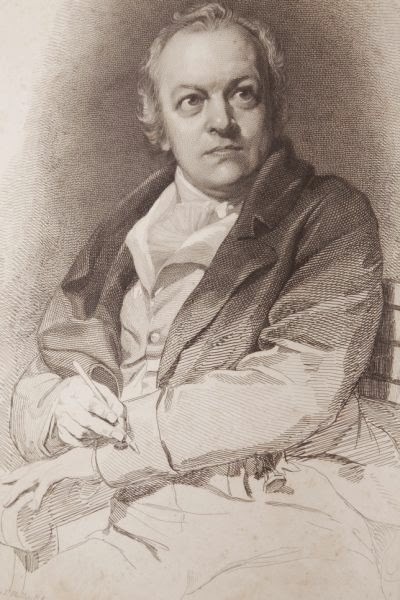 In 1832 they turned up at auction in Edinburgh, described as “A Volume of Drawings by Blake” and were sold to an anonymous buyer at the knock down price of £1 and 5 shillings. No one knows what happened to the pictures after that until they turned up in 2001 at Caledonia Books in Glasgow, bought as part of a job lot from a house clearance sale. Caledonia Books didn’t realise the red morocco portfolio labelled ‘Designs for Blair’s Grave’ contained original works of art and put them on sale as prints. In spring the shop was visited by Paul Williams and Jeffrey Bates two booksellers from Yorkshire on the look out for stock. The portfolio caught their eye and they bought it for an undisclosed sum believed to be about £1000. They thought they had something potentially valuable on their hands and took the portfolio to a firm of auctioneers who took professional advice. 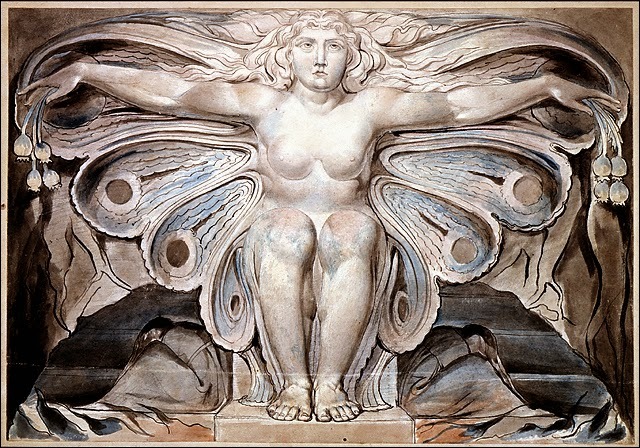 When the portfolio was shown to a pair of Blake scholars the importance of the find became obvious. The initial plan was to auction the portfolio but Tate Britain became involved and offered the two book dealers £4.2 million. The offer was accepted and the Tate was given 5 months to raise the money. Meanwhile the owners of Caledonia Books unable to live with the knowledge that they had sold a fortune for a pittance launched a legal challenge to the sale alleging they had been cheated by Williams and Bates who only had the drawings on approval. They hired a London art dealer Libby Howie to advise them and eventually reached a settlement with the two second hand booksellers in November 2002. Howie, who at the age of 24 became the first female auctioneer at Sotheby’s in 1976, persuaded Williams, Bates and the Caledonia bookshop to renege on their £4.2 million deal with the Tate and instead sell the drawings to her for £4.9 million. The reaction of the Tate isn’t hard to imagine. Howie told the press that she had bought the drawings on behalf of an anonymous art lover "a man who understands the importance of these watercolours to scholars. Their loan to a museum has not been ruled out." This turned out to be a barefaced lie – the buyers were a syndicate, a private investment group, who were only interested in how much money they could make on their speculation. Howie and her private investors then waited almost two years before applying for an export license for their Blake’s. The Reviewing Committee on the Export of Works of Art valued the watercolours at £8.8 million and gave British buyers two months to match the price. There was no chance of the Tate finding this sort of money and the export license was granted. There was more outrage when it was revealed that the collection was to broken up and sold as individual lots at Sotheby’s New York. Howie claimed that she had tried to sell the whole collection to the Getty Museum in California, the New York Metropolitan Museum of Art and several private buyers but no one was interested. Critics were sure that the sale of each drawing individually was simply meant to maximise their price and generate the most profit. The auction was held at Sotheby’s on May 2 2005. Only 50 or so buyers turned up and many of them turned out not to be in the buying mood. The £9 million sale turned into something of a fiasco – the pre-sale high estimate for the 20 lots was $17,481,500 but they sold for $7,102,640 (£4.2 million) with 8 lots bought back and remaining unsold. Once Sotheby’s fees were paid and even with 8 drawings still to sell it was looking likely that Howie and her private investors would barely break even on their deal. Brian Sewell the art critic summed up the whole affair: "Even though the goal of every dealer is profit, there comes a point when one needs to check one’s greed and rather do the right thing. Miss Howie could have very easily come to agreement with the Tate wherein she could have made a profit and the drawings would have remained together as they should have been. But I would not be surprised if she has done herself quite a bit of harm in this deal, if not apparent immediately, than certainly down the road. She has not done well by her investor client she hasn’t made the millions in profit for him he was obviously counting on."